Greetings from Brooklyn. It seems luck was on our side, sparing our wineries and New York City trade group by just a few days from Winter Storm Harper, so that our New York Drinks New York Finger Lakes January Cellar Visit could proceed without obstacles. Having cadenced our season’s worth of trade visits and with our Grand Tasting on March 26 to look forward to, I wanted to share with you a little bit as to how these trips are prepared; how our attendees end up being the lucky ones selected to visit Long Island, the Hudson Valley, or the Finger Lakes, and finally a summary of our most recent trip. When it comes to selecting trade for these trips, we aim to bring as many buyers by networking with both accounts that can move wine in volume, but also those that may provide more visibility, and always, the attendee should have a genuine interest in New York wines. For some, it will be their first professional wine trip, while others in the group will have spent time in some of the world’s most famous cellars. 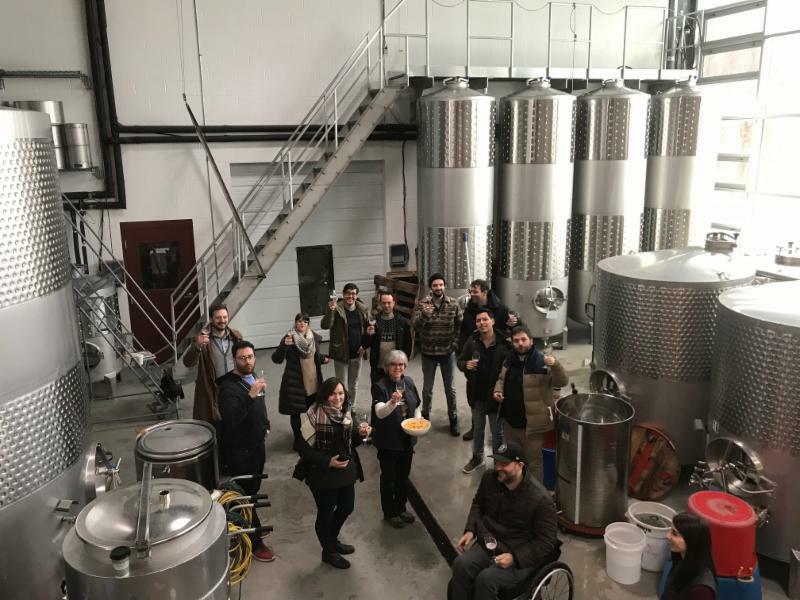 On this last trip to the Finger Lakes, we had buyers and sommeliers from across Brooklyn, Manhattan, New Jersey, and one Master Sommelier from Chicago. When Brooks Fraser first came to Finger Lakes Harvest House, she was a bartender at Gramercy Tavern, and she is now the Beverage Director at Craft. Another NYDNY alum with Gramercy tavern lineage is Isabella Fitzgerald, who began as a hostess with no restaurant experience but with an interest in beverage and is now the Beverage Director of the soon-to-open Momofuku Hudson Yards. Courtney Schiessl was a retail sales employee when she attended the very first Finger Lakes Harvest House and is now a regular contributor on wine to Forbes, SevenFiftyDaily, Vine Pair, Guild Somm, and many other outlets. We also see the value in recruiting young professionals to discover New York’s wine regions and will do our best to continue to recruit balanced, high level, and excited groups of attendees. A few highlights from this most recent trip would include an energetic dinner at FLX Fry Bird in Geneva, where Chef and Master Sommelier Christopher Bates and restaurateur Isabel Bogadtke and their team served wildly fantastic fried chicken, sides, and desserts to more than 20 attendees and winery principles -- most welcomed after a long day of travel and winery visits. Our second night’s dinner was also in Geneva at Kindred Fare, where -- after having a day and a half in the region -- the conversation turned into an almost town hall discussion of the Finger Lakes, past, present, and future. Thanks need go again to owner Susie Atvell and sommelier Bob Madill for what was a wonderful menu and wine service. NYDNY Participants raise a celebratory glass at the conclusion of their Cellar Visit at Red Tail Ridge. And I can’t help but mention both the start and finish of the tour: we began by dividing into groups to visit both historic Naples, on Canandaigua Lake, as well as Hammondsport, on Keuka Lake, to feel that sense of place that was the 19th century New York wine industry. Finally, having completed visits to our Cayuga, Keuka, and eastern Seneca Lake member wineries the previous days, we would finish by visiting our western Seneca Lake member wineries. The tour was impressively cinematic -- both a time capsule and a snapshot of modernity, but with focus, from both the ferociously attentive attendees, and the wineries and their staffs. Well done everyone. Next up, the Grand Tasting.